Milling spindles with inserted 3D tensometric touch probes were applied for on-machine measurement of highly precise parts produced on three - and five-axis milling machines equipped with linear motors and direct rotary drives. New methods of CNC control of angular NC axes during measurement were developed for parts containing hardly accessible surfaces. 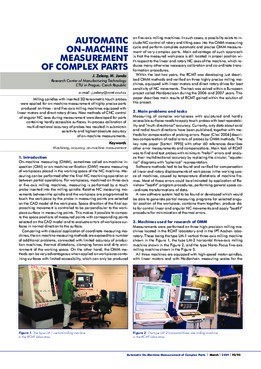 In-process calibration of multi-directional accuracy of probes has resulted in submicron sensitivity and highest absolute accuracy of on-machine measurements.